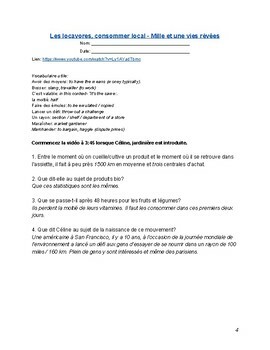 This is a listening task that you could either use as an assessment or an in-class activity that talks about the concept of locavores - purchasing products (food in particular) that are locally sourced. It uses a video clip that you can find on YouTube from a French TV show called Mille et une vies rêvées. I use this for an IB MYP Phase 4-5 class and for IB DP classes. It could also be for a French Immersion group. There is a vocabulary section, many long answer questions and fill in the blank questions. Answer key is provided.